Retinitis pigmentosa (RP) refers to a group of inherited (passed down from parents) diseases causing retinal degeneration and blindness. The retina lines the back inside wall of the eye and is responsible for capturing and processing images. Individuals with RP lose their vision because photoreceptor (light-sensing) cells of the retina gradually degenerate and then die. In most forms of RP (rod-cone dystrophy), night blindness is one of the earliest and most frequent symptoms. In some instances, the disorder progresses slowly and may be found on routine examination. In later stages, centrally located photoreceptors (cones) responsible for color and sharp central vision degenerate, resulting in loss of color perception and central vision. RP is typically diagnosed in late adolescence and young adulthood. It gradually progresses, but the rate of progression and degree of visual loss vary from person to person. Most people with RP are legally blind by age 50; they experience “tunnel vision,” with a central visual field of less than 20 degrees in diameter. RP has been associated with more than 100 different gene mutations. Genes determine the type and amount of proteins in cells. With a mutated RP gene, photoreceptors or their supporting cells have defective proteins, or have too much or too little of a particular protein. This causes abnormal function and eventual death of retinal photoreceptors. These mutations are either inherited or are acquired (ie, occur in the early stages of development before birth). Diagnosis of RP relies on the documentation of progressive loss of peripheral (side) vision (with a test called visual field perimetry) and demonstration of ocular (eye) changes associated with retinal degeneration. Retinal examination shows pigmentary changes referred to as bone spicules and optical coherence scanning confirms retinal thinning. Later in the diseases, cataracts (clouding in the eye’s lenses) can occur. Additional testing with electroretinography (ERG), which measures the electrical responses of the retina to light, confirms the RP diagnosis by evaluating photoreceptors’ function. Genetic testing, although not necessary to diagnose RP, helps with attaining an accurate diagnosis and also potentially assessing the risk of passing the disorder from parents to their children. Sometimes, laboratory tests are useful in excluding other diseases that may look like RP or in detecting conditions associated with RP. No cure is yet available for RP. Efforts to slow down the progression of RP, as well as gene therapy to cure the disease before it gets worse, are being actively pursued. However, once the photoreceptors die, the only options are to either transplant new photoreceptors or bypass them. Photoreceptor transplantation continues to be studied but so far, there are no results that show a clear benefit. Bypassing the photoreceptors is based on the finding that, although photoreceptors die in RP, their connections to the brain are mostly preserved. Bypassing photoreceptors is currently being attempted using gene therapy to make the remaining cells light sensitive (optogenetics) but this has still not entered clinical trials. Many novel methods have been proposed to connect a retinal prosthetic device to a blind eye. Multiple research groups around the world are working to find the best way to achieve artificial vision with retinal prosthesis. So far, one device in the United States and the European Union (EU), and another device available only in the EU, have received official approval for clinical use. Argus II (Second Sight Medical Products, Inc, Sylmar, CA) is the first Food and Drug Administration (FDA)-approved device in the United States for clinical use. It consists of a camera—mounted on the frame of the patient’s glasses—that captures images from the outside world and sends the information to a processing unit (Figure 2). Visual information is then transferred wirelessly to a microchip implanted around the eye; this, in turn, can prompt electric micro-impulses via a grid of tiny metal contact points to stimulate the remaining retinal cells. Simply stated, the Argus II wirelessly connects the otherwise-blind retina to a camera and jump-starts the blind eye into seeing. Long-term efficacy and safety of Argus II have been tested in more than 100 patients worldwide. A second device, the Alpha IMS retinal implant (Retina Implant AG, Reutlingen, Germany), has been granted CE approval in the European Union for clinical use. (CE approval in Europe is comparable to FDA approval in the United States.) 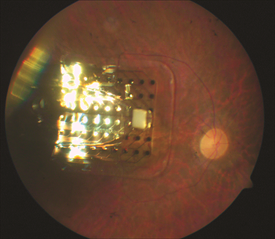 The Alpha IMS retinal implant is implanted under the retina, where it captures the light rays and relays them to remaining retinal neurons. It has shown visual improvement in about a third of the implanted patients. Video link offered with permission from the University of Southern California.